This ransomware first came to public notice in an outbreak on 27 June 2017 which affected multiple institutions in various countries, notably Ukraine, Spain, Denmark and Russia. Instructions on how to check if your F-Secure security program is using the latest database update are available in Community: How do I know that I have the latest updates? Once detected, the F-Secure security product will automatically remove the file. Once the ransomware has successfully encrypted the vulnerable machine, the encryption may be sufficient to make it very difficult to decrypt the computer without the necessary decryption key. Ensure that F-Secure Real-time Protection Network is turned on. Ensure that F-Secure firewall is turned on in its default settings. Ensure that F-Secure security program is using the latest database update are available. Identify endpoints without the Microsoft issued patches (4013389) with Software Updater or other available tool, and patch them immediately. In case you are unable to patch it immediately, we recommend to disable SMBv1 with the steps documented at Microsoft Knowledge Base Article 2696547 in order to reduce attack surface. Alternatively, configure your firewall to properly block 445 in- and outbound traffic within the organization to prevent it from spreading within the environment. Pro-actively create the file C:\windows\perfc and disable read/write rights from it for all Windows machines. Petya should not engage when it sees that file. 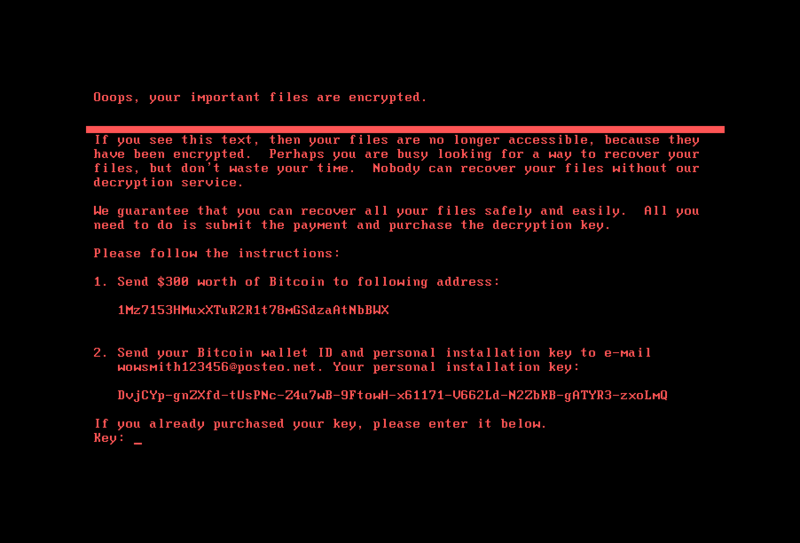 As with previous variants of the Petya ransomware, this variant encrypts the computer's Master Boot Record, then demands payment of a ransom in return for the decryption key needed to restore the machine to normal use. The ransomware is distributed as a DLL file. At the time of writing, the initial infection vector (that is, how it first gains entry onto a machine or network) for this variant is not yet confirmed. As the malware uses multiple methods to spread, there is no exact sequence of events. The malware steals administrator credentials by first dropping and running a credential dumping tool (which shares similar code to the Mimikatz password-stealing malware). It then scans the network for machines to which it can send a copy of itself using the stolen credentials. The malware also tries to find machines in the network that it can propagate to by using specific PSEXEC and WMIC commands. It will also try to exploit the SMB vulnerabilities to drop a copy of itself onto any vulnerable machines. Additional precautions that administrators can take to mitigate the spread of the Petya malware in a network using these methods is given in the Removal section above. The Petya variant from this outbreak is notable for using the EternalBlue and EternalRomance exploit tools, which first gained prominence in the WannaCry outbreak that occurred in May 2017. The malware uses these tools to exploit known vulnerabilities in the Windows Server Message Block and spread to other vulnerable machines in the same network. There are however notable differences in the implementation of the exploit in the latest samples. While the malware is waiting for the scheduled job to execute, it will scan directories on the machine to find files matching a list of extensions. The first megabyte of these files are encrypted. This encryption occurs offline - that is, the computer does not need to be connected to the Internet for the encryption to take place, as the malware does not communicate with a command and control (C&C) server to perform the encryption. Once the schedule job executes and restarts the machine, the malware interferes with the normal booting process by encrypting the Master File Tables (MFT) for NTFS partitions and replacing the computer's Master Boot Record (MBR) with a custom bootloader. Once the MBR has been encrypted, normal use of the affected computer is not possible. The ransom demand requires the affected users to send the payment to a specific Bitcoin address, and then send an email with their Bitcoin wallet ID to a designated email address. As of 28 June 2017, a small handful of payments have already been made to the designated Bitcoin address. According to news reports however, the German email provider hosting the attacker's designated email address have suspended the account, meaning that the attackers are no longer able receive the emails sent by affected users and would have no way of providing the decryption keys to them.